Dean Stephens covers the Inner Banks of Eastern North Carolina. Blogger and Radio personality Laura Leslie keeps up with North Carolina politics. Your political road covering North and South Carolina. From the Raleigh "News and Observer", one of the oldest political gossip pages around...now online. The Raleigh "News and Observer" blog covers local Wake County politics. Blog of my favorite political mag, "The Weekly Standard". If you don't subscribe to Fred Barnes and co, you should! Advancing environmental stewardship, sound science, and economic prosperity for North Carolina. Conservative guru Carter Wrenn and Liberal strategist Gary Pierce provide commentary on Raleigh and North Carolina politics. Sarah in Tampa - Tampagirl Talks Tech! Best tech blog around. The daughter of Judge Doug McCullough, who serves proudly on the NC Court of Appeals. Where policy and policy news click. Published by admirers of former Senator Fern Shubert. Shubert served the ole' North State well, until stepping down from her office to make a run for Governor in 2004. While she is greatly missed from office, she knows where the "bodies are buried" and is still found digging up the truth. The greatest conservative blogger in the state of Maryland. Check him out! Conservative Town Council member shares the inside track with you. 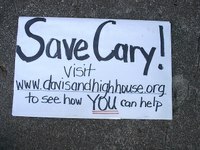 Cary politics and more. It's Time to Restore American Integrity, the Right Way written by a Marine. Gideon Moore and friends sound off with creative ideas on important issues. Blog of the North Carolina Republican Party. News for social, fiscal & national security conservatives who believe in God, family & country. We seek to uphold traditional family values, Republican principles & ideals, limited government, free markets to promote innovation, & individual freedom. The ARRA News Service is an outreach of the Arkansas Republican Assembly. Blogger Krystal Weeks writes about N. Virginia and DC metro area politics, as well as national issues. Check her out! This 30-something blogger publishes at great risk to show readers outside Cuba what everyday life is like inside the oppressive, Communist nation. Think you like Communism...read this blog and think again! Conservative Women bloggers, and a few men, who are here to refresh you when you are thirsty. A modern take on traditional women. Classier than tea service. Like Fight Club but with better hygiene. Sightly more aggro than a cucumber sandwich. The scourge of the left! Conservative mother of one. Blogs in the peach state of Georgia! The top conservatives on Twitter. If you are conservative, you should follow these people. KCC is on the list and moves up and down, depending on the day. One of my fellow Top Conservatives on Twitter. Check him out! He's not afraid to speak his mind. Based in the Motorcity. Jordan Schrader covers North Carolina government for the Asheville Citizen-Times. National conservative blogger who tells it like it is. She loves North Carolina and occasionally picks up items from KCC on her blog. Check out this site, run by Steve Noble. He's a member of the religious right and he tells the truth as he sees it. He calls himself an equal opportunity offender. Check out what he has to say! A fellow TCOTer. Fellow conservative blogger. Get your drink today. A conservative writes about all things Baltimore. He has plenty of fodder! A blog about culture, digital technology, faith, and politics. Written by Frank Williams, Gideon Moore and friends. Prepare to be mugged by conservative reality. New Bern native (and your blogger's fellow high school classmate -NBSHS '85) Steve Hale writes from Pitt County about his take on the North Carolina Political scene. Check out his blog and offer up your comments. Fiscal and social conservatism, just as our hero would have wanted it. Cary's John Byrnes writes about national, state, and local politics. He currently serves in the Army National Guard. Kevin LeCount is apparently driving with his LEFT hand, as this blog is written by my good friend who works for SEANC, the union of the NC State Employees. His wife, Heidi, works at my alma mater, Meredith and are good folks, despite their political leanings. Check them out. Congressman Mike Pence (R-IN) said on MSNBC Wednesday morning, that the newly passed Obamacare bill will raise taxes so much that people will lose jobs. Additionally, he stated that this will not stand and that the fight is not over! "We have to stop this continuous growth of government", he continued. "We don't need to answer this with more government and more debt...this is about freedom and the American people will push back hard". NOTE: If you are reading this post anywhere other than on KatysConservativeCorner.com, please go to the blog to leave any comments. You do not have to sign in. 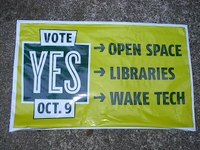 Liberal Raleigh Mayor, Charles Meeker, has pushed his one-track agenda on taxpayers since he was first elected in 2001. After taking full control of city council four years ago, he and his band of tax and spenders have focused on rebuilding Fayetteville Street and virtually ignoring the rest of the North Carolina capital city. The problem isn't that they merely wanted to re-open and fix up Raleigh's former "Main Street", it's that Meeker and company spent hundreds of millions of tax monies on turning a dilapidated area into the city's focal point, forcing it to become a destination spot. Not only did the city re-open and fix up the street, but it also build an over budget convention center, a city plaza, and an expensive hotel. While the rest of Raleigh had to wait its turn for repairs and basic services, Raleigh "invested" city tax dollars into a top drawer restaurant called The Mint. The Mint describes itself as an "adult-themed dining and entertainment, catering to sophisticated and professional adults". Raleigh simply cannot afford to be so picky about its downtown customer base, especially when the eatery was largely paid for on the backs of hard working taxpayers, most of whom cannot afford to dine there. According to a recent article in the Triangle Business Journal, the Mint is now losing business. Meanwhile, just a few blocks away, also in downtown, sits an eyesore you won't hear Mayor Meeker talk about. Tarboro Street is the source of drugs, gambling, and prostitution. It's near a local college, St. Augustine's, and the North Carolina Governor's Mansion. According a Raleigh News and Observer editorial, "disturbing crime patterns on the street show that it's a world away from those historic landmarks." Further, there have been three murders in the past three years on Tarboro Street alone. A Raleigh City police officer owned a rental house that was the subject of numerous complaints by local residents regarding domestic violence, drugs, and prostitution. On Fayetteville Street, Raleigh and its taxpayers most certainly will lose money on every one of these projects. As for how much and when, it is too early to tell. Your blogger will be discussing this issue for some time to come, so please watch this space for updates to this story. Editor's Note: Joey Stansbury, a lifelong Raleigh resident and fellow conservative blogger, contributed to this report. The Courage of Their Convictions? 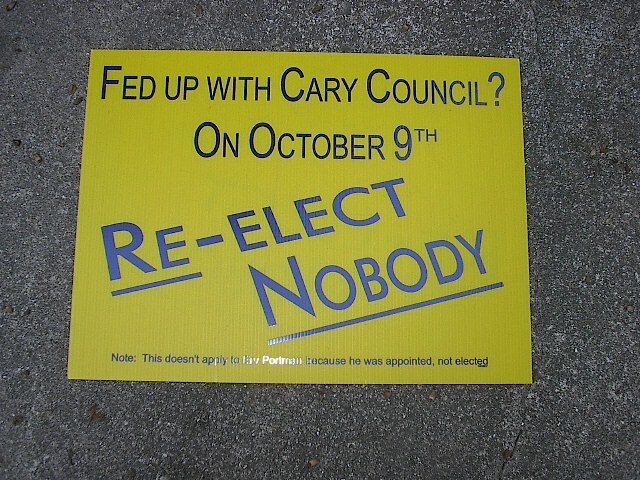 By Eric M. Weaver, Sr.
Now, far be it from me to say that the anti-development crowd who won the recent Cary and Raleigh elections has "convictions," at least in the criminal sense. But it seems to me that someone who has "convictions," in the sense of ideals, ought to be reasonably proud of them. Or, if they are NOT proud of them, one wonders about why that is. 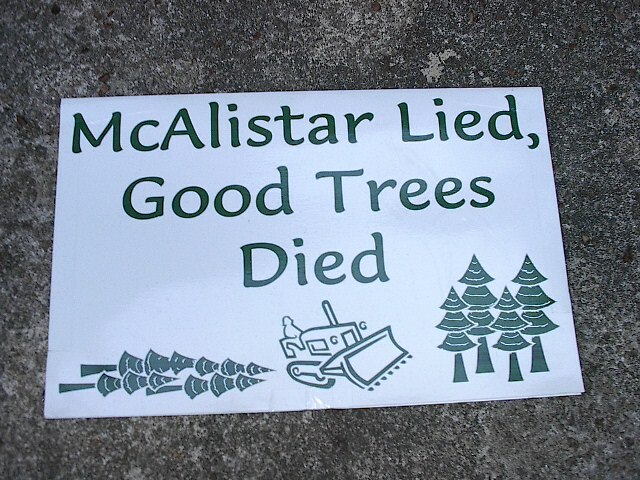 In Cary, everyone saw the "McAllister Lied, Good Trees Died" signs that were scattered around town. After the election, I inspected one such sign closely, and there is no name of a responsible person or organization on it. If a candidate put these out, he would be violating election law by omitting the "paid for by the Joe Schmoe Committee" on the sign. Maybe that is OK. I certainly do not agree with laws that infringe on the First Amendment, no matter how slightly, without a very compelling reason. That is what laws like this do. Thus, I am not calling for an investigation or anything, just setting up my next point. What I do believe is that there are COWARDS in our political midst who will lob an unsubstantiated allegation at a political figure, without giving a return address. 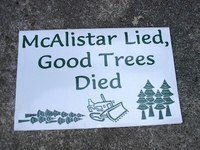 I do not believe that Ernie McAllister is a liar. What is he supposed to have lied about? When was it supposed to have happened? What is he supposed to do to defend his reputation? Start putting out signs that say, "I am not a liar?" This is dirty political pool. All is fair, I suppose, but it makes me wonder who in Cary is such a COWARD that they will not stand behind what they say. 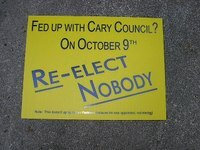 Similarly, there were "Re-Elect Nobody" signs around Cary. And just so that you do not think that there was a low supply of small print, it says at the bottom, "Note: This doesn't apply to Erv Portman because he was appointed, not elected." But, alas, this one was printed by abject COWARDS as well, as there was no attribution. At least, it did not impugn the character of anyone. 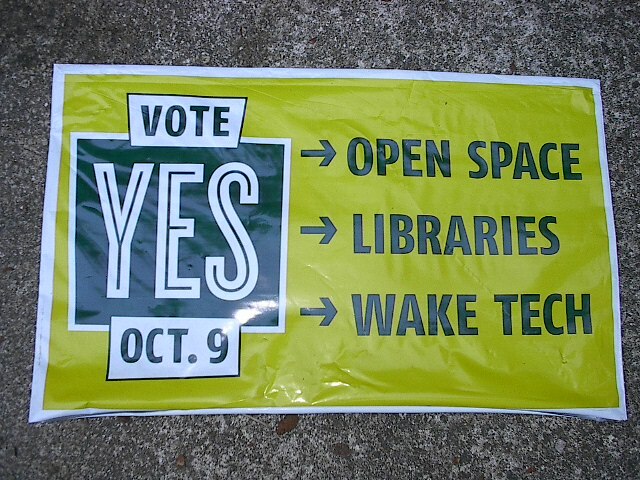 There was also the "Vote Yes on Bonds" signs scattered all about the county. These also had no attribution, but at least this was a positive (though, in my mind misguided) message as it promoted rather than denigrated something. Maybe these people were just forgetful, instead of being COWARDS. Note that there was no mention of the "I sure hope you like your tax bill as soon as we start paying for these. Not to mention the school bonds we just passed. Or next year's school bonds. Or whatever else we can think of spending money on until you stop us." I would not want to be the one who is remembered as The Man Who Raised The Tax Bills, either, so I can understand not wanting to be identified with this issue later on down the road. I vote for COWARDS on this one, too. 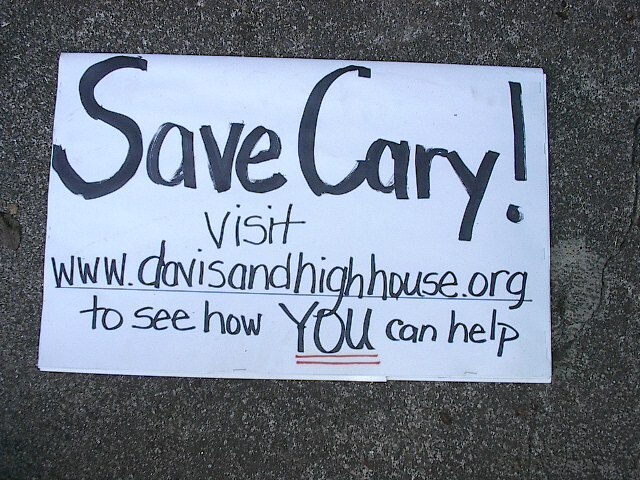 Most interesting was the "Save Cary" sign, put up (apparently) by someone associated with the www.davisandhighhouse.org website. Of course, when I found an abandoned sign after the election on the right of way, I was surprised (but not THAT surprised) to see that the hand-lettered sign was on a stolen Don Frantz campaign sign that was turned inside out. Since they put the above URL on the sign, we know who the thief was, or at least with whom the thief was associated! These lefties who are selling the message of "no growth, now that *I* am down here from New Jersey" must realize that normal people do not share that view. There are things that we need to do a much better job of, in dealing with that growth, but normal people do not want the Triangle area to become stagnant instead of thriving, nor do they want an enclave for the wealthy where average people can no longer afford to live. These are surely the wages of a "no-growth" policy. So I understand why the no-growth people who made these signs did not want attribution. But that still makes them COWARDS. A popular TV show for political junkies, NC SPIN, is hosting an upcoming growth forum in Raleigh. The October 31st event, "Growth is Everybody's Business" will focus on an issue that defined municipal elections across North Carolina earlier this month. From Asheville to Atlantic Beach, slower-growth advocates were voted in, and their pro-growth opponents were voted out. Topics to be discussed include clean water and sewage, infrastructure needs, land use, housing, government services, and public policy initiatives. For more details, down the flier, linked below.